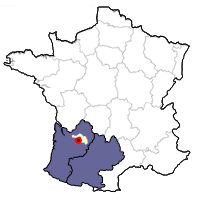 Apart from Bergerac, Monbazillac is the most known appellation in the network of vineyards to the east of Bordeaux. Wines have been made here since the 14th century and achieved particular acclaim in the 18th century when nearly the entire production was exported to Holland where it was considered an absolute rival to Sauternes. In the second half of the 20th century, due to destructive frosts, the emergence of low-density planting, machine-harvesting and excessive chaptilization, the quality and reputation of the wines plummeted. The 21st century, thanks to more conscientious work in the vineyards and the winery, has led to a return to the region’s former glory. Located several kilometers south of the city of Bergerac, Monbazillac is spread over five communes, typically on northern-facing slopes. The autumn mists that rise from the Dordogne River together with sunny afternoons provide wonderful conditions for development of botrytis cinerea, more commonly known as noble rot. If the mists are missing, the botrytis doesn’t develop. If the warm weather stops, the humidity becomes too high and the noble rot becomes grey rot. The city of Bergerac along the Dordogne River. Soils combine molasses and limestone, covered with a thin layer of clay. 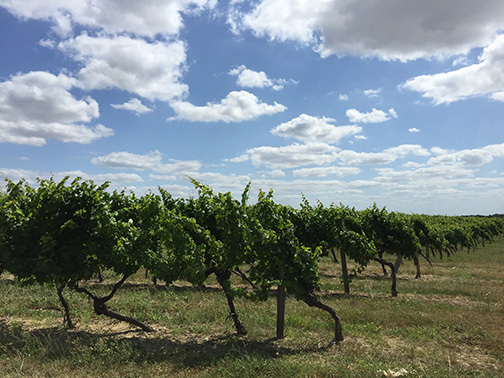 Closer to the river, increased clay and gravel provide good footholds for vines that will produce lighter, more rapidly maturing sweet wines. Two types of Monbazillac exist, the Classique with about 70 grams of residual sugar per liter, the Selection, with more than 85 grams of residual sugar from some shriveled grapes, and the Grand Cuvées, made only in specific years from the majority of grapes affected by botrytis and with residual sugars normally higher than 150 grams. Domaine de l’Ancienne Cure is an attractive hillside domaine owned by Christian Roche, a fifth generation wine grower who inherited part of the property from his parents who had sold their grapes to the cooperative for years. At the end of the eighties, Roche began bottling his own wine, giving his domaine the name of an old cure or presbytery (home for Catholic priests) that stands above the winery. Roche converted his 47 hectares property to organic viticulture in 2010, not an easy endeavor on such a varied and large terrain. While making good dry whites and reds, his forté is Monbazillac whose grapes are grown on clay and limestone slopes. The soils here is full of minerals as well as organic matter, yet with excellent drainage which forces the roots to descend deeply. His l’Abbaye Monbazillac, made with 80% muscadelle and 20% semillon, showd a wonderful deep golden color, aromas of dried apricot, vanilla and quince and tremendous glycerin on the palate.